A shallow Mw6.5 earthquake hit western Greece today in the morning. The quake had a right-lateral strike-slip mechanism and occurred at the Cephalonia transform, offshore Levkada. Two people died and some damage to buildings was reported. The event caused environmental earthquake effects (EEEs), namely widespread rockfalls that produced an amazing dust cloud. The blog North Ithaca has some great pictures of collapsed walls, damage to buildings and the dust cloud. In early 2014, two right-lateral strike-slip events struck Cephalonia within eight days, leading also to intense EEEs (Valkaniotis et al., 2014). This region has among the highest seismic hazard in Greece (Papagiannopoulos et al., 2012) and has been hit by several damaging earthquakes in the last decades, including a M7 event in 1983. Valkaniotis, S., Ganas, A., Papathanassiou, G., & Papanikolaou, M. (2014). 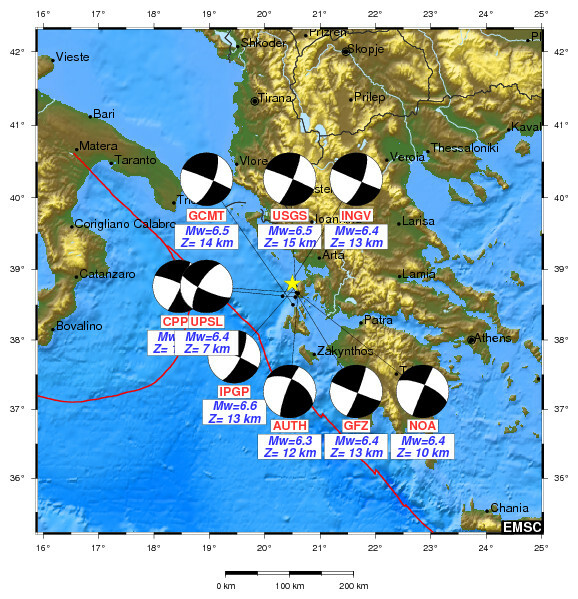 Field observations of geological effects triggered by the January–February 2014 Cephalonia (Ionian Sea, Greece) earthquakes. Tectonophysics, 630, 150-157. Papagiannopoulos, G. A., Hatzigeorgiou, G. D., & Beskos, D. E. (2012). An assessment of seismic hazard and risk in the islands of Cephalonia and Ithaca, Greece. Soil Dynamics and Earthquake Engineering, 32(1), 15-25. Michetti, A. M., Esposito, E., Guerrieri, L., Porfido, S., Serva, L., Tatevossian, R., … & Roghozin, E. (2007). Environmental Seismic Intensity Scale-ESI 2007. Memorie descrittive della carta geologica d’Italia, 74, 41.